Volunteer in Guatemala with A Broader View Volunteers, our highly rated non-profit charity organization. 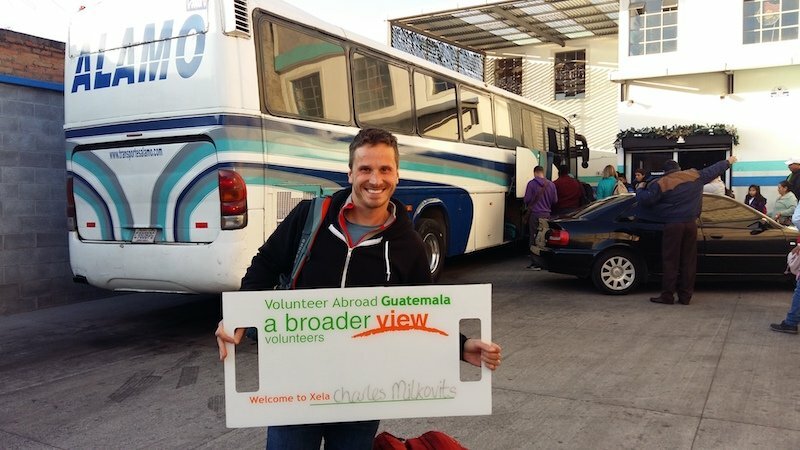 Volunteer placements are located throughout Guatemala, mainly in the cities of Quetzaltenango, Alotenango and Antigua. Volunteers can choose between 12 programs options throughout in Guatemala. Quetzaltenango is the second largest city, located in the highlands of Guatemala, located about 3 hours from the Guatemala City airport. Volunteers working on the medical project can get hands on experience working with local doctors and nurses in small local clinics for the poor, providing check-ups and basic medical care in poor communities and at orphanages. Medical brigades including ambulance/rescue, physician assistants and nursing internship can be arranged in Guatemala. With housing available up to 25 volunteers, A Broader View has hosted faculty led medical missions as well as college and high school student groups in the city of Quetzaltenango. If you have a group of 5 or more interested in volunteering together, customized programs can be arranged. A Broader View Volunteers has extensive experience working with students, teachers and families providing tailor-made service trips for small groups. By choosing to volunteer in Guatemala you have an extraordinary opportunity to experience the fascinating culture of one of the most diverse countries on the American continent. Though a fairly small country compared with its neighbors to the north, Guatemala boasts a geographic and ecological diversity that far surpasses many larger countries. From tropical rainforests and beaches to volcanoes and pristine mountain lakes, Guatemala has it all! The area that is now Guatemala was once the heartland of the Maya empire. Many Maya ruins have been discovered and partially restored in recent years which can be visited on your free time. Today Guatemala is the most indigenous diverse country in Central America. Mayan culture and traditions are very much alive and many modern Maya, particularly Maya women, still wear their colorful traditional attire. By becoming a volunteer in Guatemala you will not only support the poor and disadvantaged, you will be fully immersed in the vibrant Latin American culture. ABV Volunteer projects focus on supporting woman, children and health care centers throughout Guatemala. 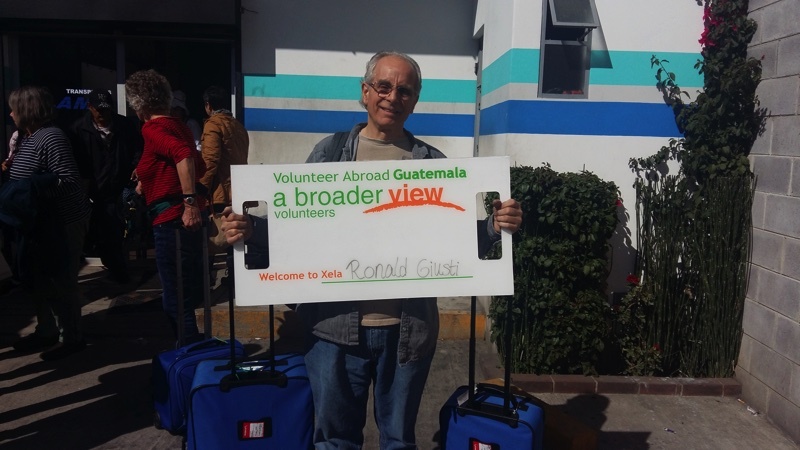 A Broader View Volunteers support in Guatemala have helped hundreds of families in Quetzaltenango with medical and social support projects. A Broader View has arranged medical brigades and international service trips for university groups, for those seeking Doctors without Borders alternative trips, and gap year groups. Volunteering in a healthcare setting in Guatemala can be tailored for student nursing groups, EMTs and other medical professionals. We also offer meaningful short-term group trips for professionals over the age of 50. If you have a group of 5 or more interested in volunteering together, customized programs can be arranged. A Broader View Volunteers has extensive experience working with medical school groups, physician assistants and student nurse groups providing customized service trips for small groups. Minimum Age: 12 to 16 yrs if volunteering with parents. Volunteer in Guatemala with A Broader View Volunteers a top rated non-profit charity organization, which works tirelessly to support our wonderful volunteers and serve the local communities where our volunteer programs are located. Placements in Guatemala are based in the cities of Quetzaltenango, Antigua, Alotenango.. Program placements are tailored to the volunteers different interests and skill sets, but still allow volunteers time to explore the Central America local culture and activities during their free time. The type of programs in Guatemala vary widely, offering everything from education to health care. 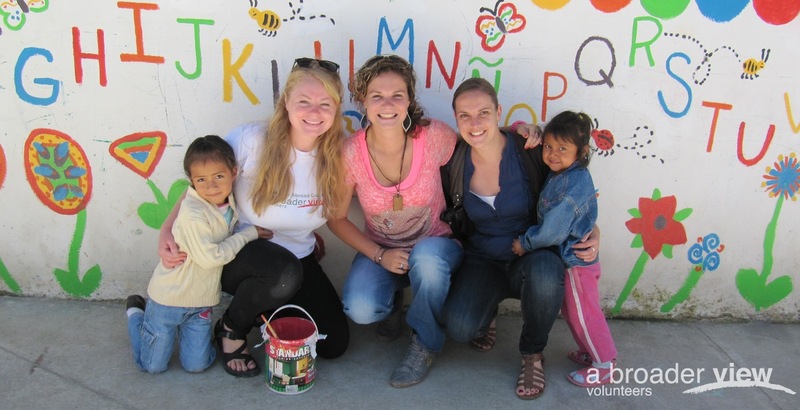 Volunteers can choose between 12 program opportunities in Quetzaltenango, Antigua, Alotenango. International volunteer help is not only appreciated by the local community, it is severely needed by the millions of Guatemalans living below the poverty line. With thousands of children living and working on the streets, as is so often the case in developing countries like Guatemala, our volunteer programs are designed to support the needs of local teens and children in desperate need of assistance. Many of our volunteer abroad programs cater to underprivileged women and children’s care, education and health requirements. Our extensive range of social programs in Quetzaltenango, Antigua, Alotenango, Guatemala programs include: Pre Medical, Pre nurses, Pre Dental, animal rescue center, Elderly care, woman support, internships, teaching in primary and secondary schools and volunteering in orphanages and day care centers and many more programs. To help you settle into your placement, we also provide the opportunity to combine all of our programs with Spanish Immersion Lessons during your time in Guatemala. Volunteering in Guatemala is an incredibly rewarding experience. We welcome volunteers of all ages and from all backgrounds to join us. Whether you’re seeking volunteer abroad programs for college students or voluntary work for over 60s, as a trusted non-profit organization which prioritizes the safety of our volunteers, we are the go-to for volunteers across the globe. We also offer customized programs with flexible arrival dates to best suit the needs of the remarkable volunteers we depend on to help us make the world a better place. If you’d like to volunteer, Guatemala is just one of the countries we’ve taken under our wing, supplying a steady flow of volunteers and providing year-round financial support to local projects in Quetzaltenango, Antigua, Alotenango. Wherever you decide to volunteer, A Broader View give you the opportunity to participate in meaningful community service work, learn a foreign language, make lifelong friends and discover that one person really can make a difference. Your search for the best volunteer abroad programs ends here – volunteer in Guatemala with us and gain A Broader View of the world. Welcome to Guatemala 🇬🇹. Our Names are Petra and Juan and we are your ABV coordinators while you are staying in Guatemala. Our country has one big city, Guatemala City. You will be working in Quetzaltenango (Xela). We will be ready for support 24/7 in case you need to contact me urgently. We will introduce you to your volunteer location and staff. The temperature and climate varies in Guatemala according to the altitude. The average annual temperature on the coast ranges from 25 degrees Celsius to 30 degrees Celsius (77° to 86° Fahrenheit ). When you get to higher places in the country the temperature is much lower with only 15 degrees Celsius (52° Fahrenheit). The rainy season starts in May and lasts until October inland. At the coast it starts in May and lasts until December. Most rainfall (rainy season) is seen in May, June, July, August, September and October. Quetzaltenango has dry periods in January, February, March and December. On average, the warmest month is . On average, the coolest month is . ABV was instrumental in providing me with an experience I will never forget. It was bitter-sweet to see how “the other half” lives. It seems they are satisfied with their lives, even though they don´t have much. I was also glad to have an opportunity to learn Spanish and meet travelers. Overall it was very good. The online chat persons always seemed to be available and answered all of my questions thoroughly. There is so much to see and do in and around Xela. It´s also relatively easy to get around to the neighboring cities like those around Atitlan and Antigua. ABV is a great way to get out and make a difference while knowing you are with a reputable organization that will look out for you, prepare you and ensure a great learning experience. The local support was very thorough and responsive to any questions or help I needed. Extra costs: Flights to Guatemala. Entry Visa (if applicable). Departure taxes. Vaccinations. Local Transportation. Travel & Health Insurance (approx. us$53). Laundry and Internet (us$10 and us$15). Volunteers are provided breakfast, lunch and dinner at their accommodation during the week and weekends. Breakfast typically consists of toast, fruit, eggs, cereal accompanied with milk, tea or coffee. Dinner usually includes: meat (cow, chicken), potato, rice, vegetables, and a variety of tortillas, pupusas, tostadas. Volunteers can be away from their accommodation mid-day so they take a lunch bag or they go back home. We recommend budgeting between US$5 and US$10 per day to purchase lunch if you don't return to the host family, let the host family know if you change the lunch plans. If you have specific dietary requirements, our local teams and home-stays can customize to you but be flexible as well. Check out the famous hot springs at the Zunil Volcano on this tour of Fuentes Georginas from Quetzaltenango. Relax and indulge in thermal waters that were discovered back in 1902. These communal baths offer up the perfect escape for travelers who want to unwind after epic outdoor hikes or fun-filled city explorations. Experience spectacular views of Santiaguito — one of the world’s most active volcanoes — on a half-day trekking adventure from Quetzaltenango. Alongside your guide, you’ll embark on a moderately steep hike that soon transforms into flat terrain replete with diverse flora and fauna. On arrival at an ideal vantage point, you’ll be rewarded with views of the Santiaguito volcano erupting. Marvel as molten lava and billowing smoke explode from the volcanic crater to form an incredible spectacle. On this small-group tour, limited to 10 people, you’ll receive personalized attention. Spend a day in the fabulous Volcano and Laguna de Chicabal, the most important ceremonial center of the Mam culture. Join a journey through the natural paths of the volcano where you´ll get to know 40 different mayan altars where the most important ceremonies are celebrated on memorable dates their calendar year round. Uncover the flavors of Quetzaltenango on this street food tour that showcases the best dishes, treats and snacks of this epic city. Follow your local guide to stands, stalls and shops. Learn about traditional foods and typical dishes as you sample and savor the best of Quetzaltenango.